“Final decisions about layoffs will be announced Friday.” Sergeant Lammers panned the room, stopping to make eye contact with Jackson. 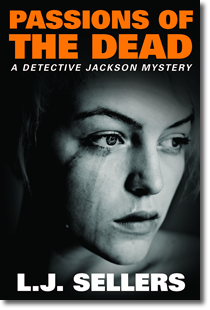 He and fifteen other detectives were crammed into an overheated conference closet. They shifted in their seats and tried not to glance at each other. “Two detectives will be cut, one from vice and one from violent crimes.” Lammers’ voice was deadpan, and for the first time in his twenty-year career, Jackson worried he might lose his job. He’d been written up and suspended recently, and now he had a health issue the department might consider a liability. What would he do if he lost his job? He was still a month away from his twenty-year pension. As he raced over Ferry Street Bridge with the rushing water of the Willamette River below, Jackson worried about what was happening to his hometown. For most of his life, Eugene, Oregon had been a safe midsized college town—a tree-loving, friendly place to grow up in, with the mountains and the ocean only an hour’s drive away. A perfect place to raise his child. Now Eugene was a small city with a growing crime rate, a meth scourge, high unemployment, and a dying downtown—and no money to fix anything. They’d never had a mass homicide though. He’d worked several murder–suicides in which a man had shot his wife or girlfriend then himself, but never a crime scene with four people killed. What if some of the victims were children? The home was in the Coburg Road area, in one of the older neighborhoods where the real estate had less square footage but bigger yards. A modest house that needed paint but otherwise looked cared for. The front lawn had been recently mowed and someone had planted petunias along the walkway—signs of an unusually warm month of May. A red F-150 pickup and an old green Subaru sat side-by-side in the driveway. The Subaru sported a bumper sticker bragging about a Student of the Month and another that said I Love Al Gore. The woman, late thirties and heavyset with hair to her waist, glanced at Jackson, then continued weeping into the phone as she described her ordeal to a listener. “Don’t let her leave. I need to talk with her in a minute,” Jackson said and hurried past. He needed to get inside the home and see the scene before it was swamped with people doing their jobs. Behind him, the scream of an ambulance raced up Harlow Road. Why the siren? Jackson wondered. They wouldn’t need its paramedic services, just its cargo space to transport bodies. Buy Passions of the Dead.